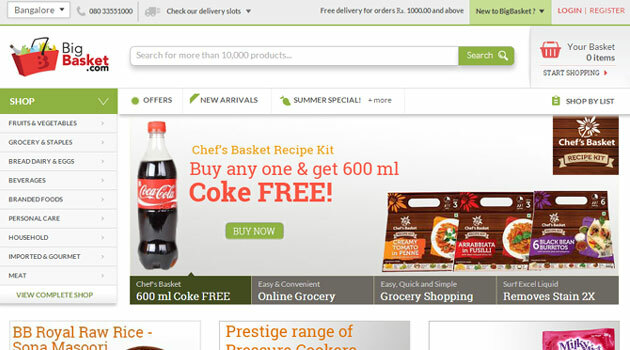 Online grocery retailer BigBasket.com, owned and operated by Bangalore-based SuperMarket Grocery Supplies Private Limited, has secured $3 million in a bridge round of funding from a Singapore-based private investor, sources close to the development told Techcircle.in. When contacted, BigBasket co-founder and CEO Hari Menon confirmed the funding amount, "We are in the process of (raising) our Series B. We will tell you about it once we raise our entire funding. This will become part of our next round." He, however, declined to share more details. BigBasket.com was founded by a team of five - VS Sudhakar, Hari Menon, Vipul Parekh, VS Ramesh and Abhinay Choudhari. The team has both offline and online retail experience, as they had earlier set up India's first e-commerce site FabMart.com in 1999, and then established the Fabmall-Trinethra chain of more than 200 grocery supermarket stores in southern India. Trinethra was sold to Aditya Birla Group in 2006 and currently operates under the brand name 'More'. BigBasket.com is an online grocery store with operations in Mumbai & Hyderabad, besides Bangalore. The firm claims to have over 10,000 products and 1,000 brands in its grocery list that includes fresh fruits and vegetables, rice and pulses, spices and seasonings, packaged bread, bakery and dairy products, and other branded foods. The firm had previously raised $10 million in Series A round of funding from Ascent Capital. This money came in tranches with the final tranche coming in late last year. Another source quoted above said that the firm has also received some investment from media group Bennett Coleman & Co Ltd (BCCL), which typically follows an ad-for-equity strategy. BCCL had previously also backed ZopNow, another Bangalore-based grocery e-tail venture and this could mark a competing transaction for the firm. It could be immediately ascertained what is the equity commitment and if it's indeed in lieu of ads to be floated through BCCL's various media vehicles including newspapers such as The Times of India. An email query sent to Brand Capital, the private treaty investment arm of BCCL, did not immediately elicit a response. In an interaction on the sidelines of Techcircle Startup 2014 in February in Bangalore, Hari Menon had said that the company was close to expanding its operations to six more cities. It would start with Delhi NCR, Chennai and Pune, and then would go to other cities including Ahmedabad and Chandigarh. Menon also claimed that BigBasket was doing approximately 2,500 orders per day on an average, mostly from Bangalore, and was close to being Rs 100-crore company in terms of gross merchandise value (GMV). According to the CEO, BigBasket has close to 70,000 customers in Bangalore alone. While grocery remains the core business, the firm is planning to add kitchen wear to its category in the near future.